In 1931, Victor introduced their first budget label, Timely Tunes in an attempt to cope with the economic downturn. Timely Tunes was not much of a success, as only about forty were issued over a period of three months beginning in April of ’31. In that short time, however, quite a bit of fascinating material was issued, including this intriguing pair of Dallas, Texas recorded folk songs by Newton Gaines under the pseudonym “Jim New”. A listing for Gaines’ other record in a 1930 Victor supplemental. The colorful character of Dr. Samuel Newton Gaines (sometimes called Newton C. Gaines), born in 1890, was a professor of physics at Texas Christian University in Fort Worth noted for his work with sound waves, and long time member of the Texas Folklore Society, serving as president in 1929. Besides physics, Gaines had a passion for Western folklore and cowboy songs, and also enjoyed throwing boomerangs and wearing kilts and colorful caps. In the 1920s, Gaines served as the first chairman of the fledgling physics department at TCU, and dedicated himself to ensuring the department’s excellence. In October of 1929, Newton Gaines recorded four cowboy songs in one session for the Victor Talking Machine Company on their Dallas field trip. One pair of sides was issued on Victor’s V-40000 rural series and the other two were pseudonymously released on their short-lived Timely Tunes budget label in 1931. Gaines was an associate of John A. Lomax, recording several cylinders for the Library of Congress under his supervision, and receiving mention in Lomax’s 1934 book American Ballads and Folk Songs. Gaines retired from TCU in 1958 and died in 1963. Timely Tunes C-1564 was recorded October 12, 1929 in Dallas, Texas, and this issue dates to 1931. While the label credits the fictitious “Jim New” as the artist, Newton Gaines is credited as the arranger on both sides. On the first side, Gaines sings a railroad disaster ballad, “Wreck of the Six Wheeler”, which bears great lyrical resemblance to Andrew Jenkins’ “Ben Dewberry’s Final Run”, and “Milwaukee Blues” as recorded by Charlie Poole’s North Carolina Ramblers, as well as Richard M. Jones “Trouble In Mind”. This one’s not a very cheerful song, and Gaines’ mournful voice certainly doesn’t add any joy to the mix! 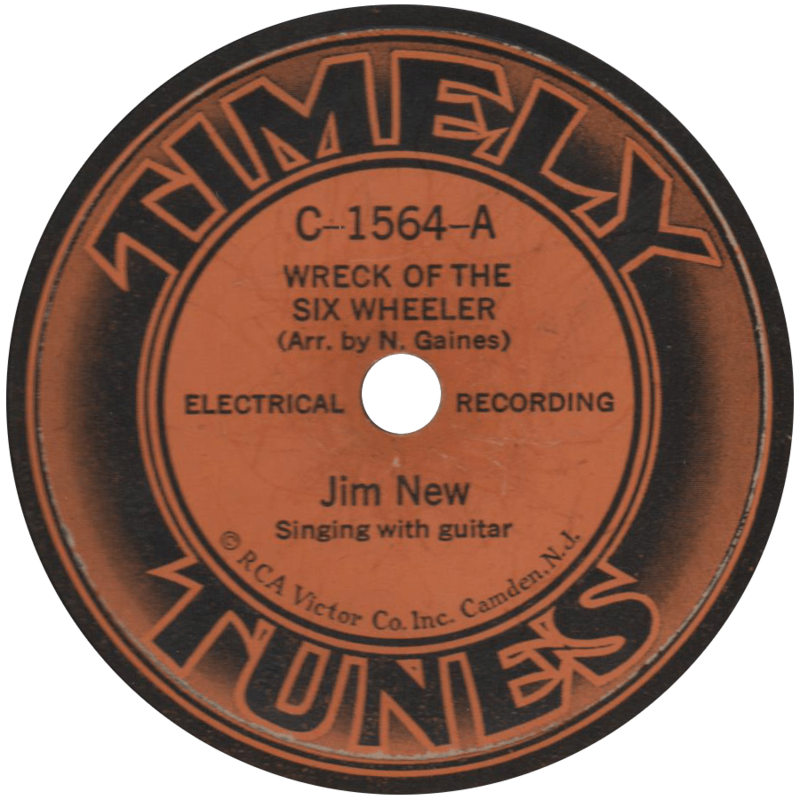 Wreck of the Six Wheeler, recorded October 12, 1929 by Jim New. On the flip side, Gaines sings a considerably less depressing version of the classic Texas folk song, “For Work I’m Too Lazy”, also known as “Rye Whiskey” or “Jack o’ Diamonds”. 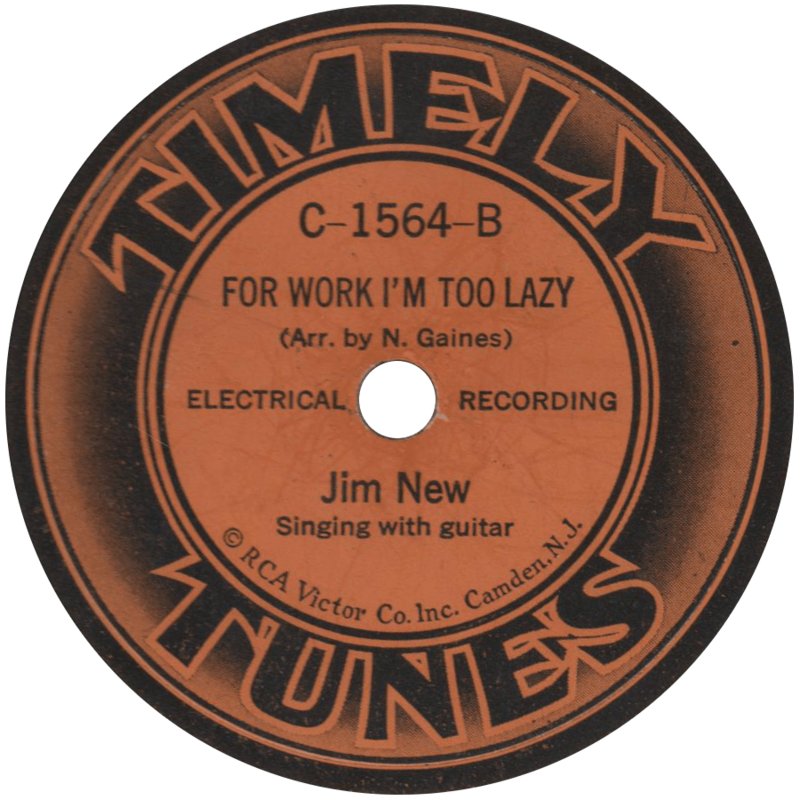 For Work I’m Too Lazy, recorded October 12, 1929 by Jim New. This entry was posted in Records and tagged 1920s, 1929, 1930s, Cowboy, Dallas, Field Recording, Folk, Hillbilly, John A. Lomax, Newton Gaines, Rare Labels, Singing with Guitar, Texas, Timely Tunes, Victor by R. Connor Montgomery. Bookmark the permalink.